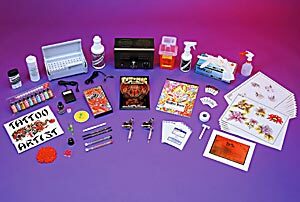 Our Super Saver Tattoo Outfit #3 is similar to our Super Valu #2 kit with a few different products added. This kit is available with or without a sterilizer–we offer two models to choose from. It includes 2 Puma Quick Change Tattoo Machines which feature 8 wrap coils, a rubber nippled armature bar, nickel plated 2-piece springs, a heavily chrome plated investment casting frame with all stainless steel hardware, silver contact screw, 10 MFD 35 volt capacitor, and our patented (#D356,944) LeeverLoc Fastener Device. And like all of our tattoo machines, a two piece stainless steel tube (the grip and the tube are one piece – only the tip is soldered on). Included in the outfit is the book Tattooing A to Z by Huck Spaulding and the instructional video The Art of Tattooing which will help answer many of the questions you may have as you progress.